I was a big believer in this app. I remember when google dropped their support of google reader, I was sad; then I found Feedly. Feedly was ok, and it got the job done, but was not really a pleasant experience. Then I found Reeder; I was so excited. I remember when Reeder was amazing, fresh, and just what I thought the RSS experience on an iPhone should be. When Reeder was updated to Version 3, I jumped in. Now, it’s old and clunky. The UI Design feels ancient and I don’t know that it’s worth the money I payed for it anymore. I only use it because I haven’t found anything better. If you find something that works for you, go for it. This app hasn’t been updated in 8 months. I can only imagine there’s going to be a new version for which I’ll have to spend $40 to update all my devices. Very disappointing. 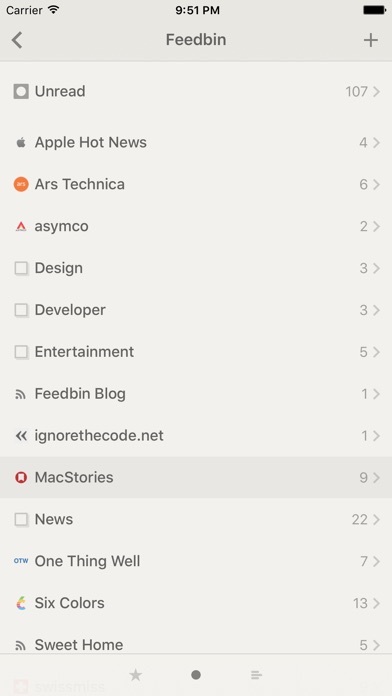 Reeder has always been my go-to news reader (iOS and macOS). Developer was pretty awesome and receptive to feedback like incorporating keyboard support. But then the dev stopped updating it, and issue creep set in. Just had to have my iPhone replace and can’t figure out how to add back my multiple feedly accounts. I keep trying to update password, but it tells me the one that successfully logged in is already logged in. Ugh. So irritating. To the dev, I say, if you need more money, I’ll be happy to drop it if you put out version 4! I’ve enjoyed using your apps over the years and thank you for your efforts and updates. I’m also an iOS dev. And I get that things happen. New job or family additions. It’s all good, but if you no longer plan to support this app. I/we need to know so can commit to another app going forward. Meanwhile, for those of you looking for a replacement... Fiery Feeds seems promising! Still going strong. Some minor improvements would be nice (such as expiring old unread items from certain noisy feeds) but overall this is one of my most used apps. I have been using Reeder for years, and in the past I would have considered it a 5 star app, but it is rarely updated by its author, and the current version has some display problems on my 12” iPad Pro. It also is frustrating that while Apple has iCloud for syncing across platforms, Reeder requires that you use a 3rd party service that can cost $19-$60 per year. I would much rather trust Apple with my data than some 3rd party startup that not only will charge me, but will also likely have less respect for my privacy. Used to be the best app on my phone. Now it’s borderline unusable. Crashes every time I use it. Not sure how the mighty have fallen so hard. Great app design but the developer has seemingly abandoned the app. Would not recommend purchasing the app at this time. Adding an article to Reading List causes the app to crash on a regular basis. No support. No instructions. Useless. Avoid! For an expensive app like this whose desktop version works well, I expected functionality and support. I found neither. Avoid this app! The color scheme is so low contrast (light gray on medium gray) that titles and descriptions are needlessly hard to read. Every time I open the app, I’m struck by how depressing the UI is. There are nice animations and all, but the app is unpleasant to use. I keep going back to my previous RSS reader because the browsing and reading experience is so much better. I’ve been subscribing to RSS feeds for over a decade and have used quite a few apps over the years. I’ve found that everyone wants different things when it comes to an RSS reader, so it’s not always best to recommend the same one to everyone. 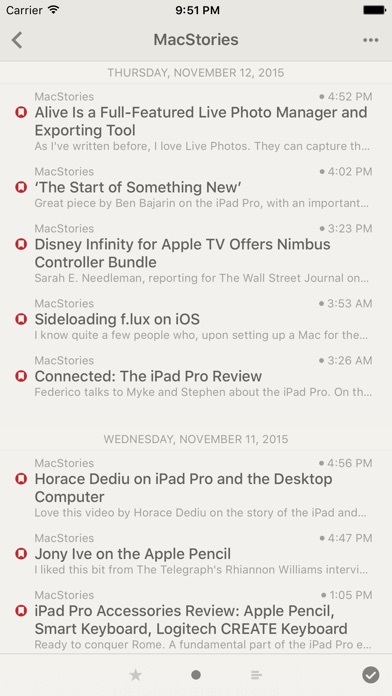 Reeder is, to me, the best RSS reading application that I’ve ever used. In certain ways it is delightful. It has a good selection of fonts, plenty of customization for line height and width, an enormous selection of third party service integrations, and endless customization with regard to how many articles are saved, what gets cached, what third party services get displayed when you click the share button, and settings for many other little attributes of the application. In other ways, it’s perfectly transparent. It’s lightning fast, the organization model is sensible and intuitive, the gestures are customizable and natural, and the UI allows you to focus purely on the content. The fact that it has a Mac app as well is a major positive for anyone that reads from their computer. Everything gets synchronized between the applications and it makes it super easy to just pick up reading on whatever device you want to read from at that moment. Reeder is probably for you if: - You’re not interested in an algorithm determining what things you would be interested in because you already did that with your own brain when you added the RSS feed url to the app - You’re not interested in an algorithm pushing certain stories to the top of the list because you just want to go through a chronological list of articles and decide what you want to read yourself. - You follow a large quantity of feeds or have a lot of articles per day (Reeder is still excellent with smaller lists, but it does excel with high volumes of content where other apps fail) - You like to be able to choose between serif or sans-serif fonts and customize line height and text size - You use third party services for saving articles - You just want something that is the best possible version of an RSS READER. Not some weird service that fills up your page with non-chronological, algorithmically sorted blocks of giant pictures with no text, that you then have to click on to see anything of use. I have tried Unread as well but it lacks in customization, makes weird decisions with themes and fonts, and has a tendency to be slow in weird ways (like long transitions and seemingly long amounts of time between a tap and the associated event occurring). I’m always careful to give a negative review because I know how important a review means for indie iOS developers... Sorry, no, not this time. I’ve heard that reeder is a prestigious and great app, in the domain of rss reader. But it just turns out to be a totally disappointment. You have to follow the design choice of the developer, there’re some options that you can tweak in setting page, but that’s even far from the minimum. If you are not satisfied with some UX logic? Most likely you’ll have to get used to it(with some bugs that appear randomly). What’s worse, developer never replies your email! Hence 2 stars, I’m not giving 1 star because, well, at least it’s a working app. I used to love this app. There is a big issue with LTR language feeds with this app. I sent couple of emails in the last 7 years of being user of reeder, got no responds and no fixes. From what I can tell of the sparse documentation, I cannot see any way to import OPML newsfeed lists. I wrote them asking about this, but never received a reply after several weeks. With poor documentation, poor import capabilities and nonexistent support, stay away from this app. Although Reeder is the best app for iOS, the developer never communicates with users. Reeder needs to be updated with iPhone X support. ————— 8th Nov 2017 Shocked that the developer is actually still working on the app. Avid user for the past several years and no other RSS reader compares to the customization Reeder has. Most importantly, it has iPhone X screen support now! Continuously crashes after update. Needs a search feature. Thank you for timely iPhone X support. Thanks for the iPhone X support! Thank you for iPhone X update! Still the best RSS reader for iOS and the iPhone X update is exactly what I was waiting for! The BEST news RSS reader. Been using Reeder for years, and it’s still the best. Even better with fullscreen iPhone X support on iOS 11. The best RSS reader I've used. It looks great and syncs fast. Most importantly it’s really quick to interact with. I can blow through large numbers of unread links, or switch into the text only “reader” view for longer articles. Still by far the most used app on my phone. Thank you for continuing to support this incredible app! Thanks so much for the iPhone X update. This was the one and only app I’ve been anxiously waiting for some X love and it’s amazing. I’ve seen some people online try to say this app doesn’t get updates often like it should be honestly this app is so amazing it doesn’t need special new features. It’s is by far the greatest RSS app out there. No one else come close to the ease of use and sure beauty and simplicity that this app does. My most used app. Updated for iPhone X.
I’ve been using Reeder for years and it is my single most used app by far (lives in the dock). I actually emailed the dev yesterday wondering if the app would be updated for my new iPhone X and received a response in less than an hour assuring me it was done and submitted for review. I just saw that the app was approved and it’s working well on the iPhone X. Reeder does a few things that no other RSS reader does including emailing entire articles (rather than just the headline and link). You can also pre-populate addresses for sharing by email - I have one close friend whom I share articles with and it’s 2 clicks for him to receive the full article in his inbox. The feed is very nicely minimalistic only showing headlines and the first line of text allowing you to go through your feeds fast without thumbnails, etc stealing focus. The Mercury reader does a great job at pulling in the essentials of articles including key images. I will always love this Reeder more than others! Please just add iPhone X support. Updated: beautiful, perfect and seemless. I love this app and this update removed the black bars on the X and I couldn't ask for a better rss feed app that this. Thank you! UPDATE: As promised, with the iPhone X support update comes my five star review! First off, I love this app, I really do! I use it every day and it was one of the first apps I installed on my X. Normally I wouldn’t drop a star rating for not supporting such a new product but I’ve read that apps that support auto layout should automatically support the X. I don’t see much about this app that wouldn't support auto layout. Please update!! I will gladly update my review to a much deserved 5 stars! Thanks for the update for iPhone X! Awesome update! Thank you for X screen update! Was afraid your app might be dead. I use it so many times a day! The best new reader on the iOS platform! 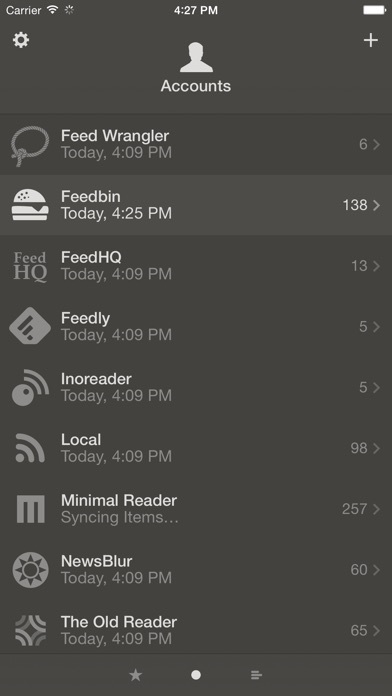 Simply put, the best feed reader you can find on iOS. It’s a pleasure to use — and stays out of the way of reading and organizing your feeds. Updates are usually when needed, but it is supported. The application is so polished now, that just the occasional features or tweaks are needed. Love this app. Use it everyday. Thanks for the iPhone X update. I’ve tried other rss readers and keep coming back. The ability to setup the quick swipe to save to something like pocket is indispensable. One request: please make a light and dark color theme with an option to auto toggle dark / light theme based on screen brightness setting (like tweetbot) or based on time of day. I love Reeder. I have for many years now. So happy to see it updated for the iPhone X. Keep it up, Silvio! Thanks for updating to support the X! I used to love this app but it’s been awful lately. There’s no iPhone X support and a few annoying bugs. I’ve since tried many apps and settled on News Explorer. There's not much I can say that hasn't been said about Reeder 3. It is elegant, simple, and does its job flawlessly. By far the most used app on my phone and the best at what it does. I’ve used other RSS apps but none come close to this one. One a side note, thanks for updating the app to support the iPhone X! I was very worried that this app would not be updated but it has been and I am very relieved. I would donate another few bucks if possible to support the development, thats how good this app is. The version between iPad and iPhone have inconsistencies. No updates for months and months. No communication from developer. Keeps the tittle of the best RSS reader for the iPhone. Update: Not at all impressed with this app anymore. I used to love it, but as of late my perception changed. The developer does not update the app, does not respond to support emails, and does not listen to customer concerns. Case in point - I reported the major flaw noted below, both via email and app review, at least a year ago and absolutely nothing has changed. Additionally, the app is 100% inaccessible to anyone who has to use accessibility features. And no update to support iPhone X, but I’m not surprised. And when restoring the phone from backup it failed to sync with feedly, it throws up an Issues screen and tapping the account does absolutely nothing. Critical flaw: It's way too easy to accidentally mark everything as read and no way to undo that! While reading at night I accidentally long pressed and BAM hundreds of articles I intentionally saved to read later were marked read and gone. No way to revert. All my saved articles lost. Very very upset about this. Who even uses this gesture anyways, who batch reads everything above/below an article? I've never once wanted to do that. This should be removed or at very least add the ability to turn this off. Update: This happens frequently, at least once a month. Absolutely infuriating. Needs iPhone X support ASAP. Reeder has been a delightful app for the longest time. Updates are pretty infrequent, and that’s fine considering the medium isn’t evolving. But, it’s a little disappointing that they didn’t do anything for iPhone X owners. I’m left with ugly bars at the top and bottom of the screen. It is easily a five star application if you use any other iPhone, but no X means no five stars. I will update this review the second you add support. Wish the mobilizer icon was lower. I’ve been using this app for forever. It’s great. Now that there are larger iPhones, I find myself really wishing that the Mobilizer button was lower on the screen. It is near impossible to hit one handed without invoking reachability. I wish I could swap it with one of the buttons lower in the interface, such as the button that toggles whether or not the article is starred. Anyway, keep up the good work! Update: Still works great. I use it every day. 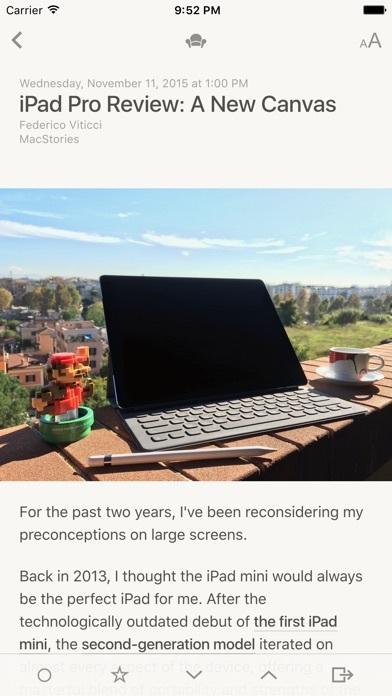 I especially like the ability to customize the right-swipe and left-swipe gestures—I use right for Mark As Read and left for Save to Instapaper. Also the Mercury Reader feature is an easy way to work around partial-text feeds. My favorite RSS app. Thanks for the update! I bought this app years ago and use it daily. It’s the best mobile RSS reader on any platform. However it hasn’t really changed much. Aside from iPhone X support, which is good, the app looks and feels a lot like the same app I first purchased in 2011. While this app was a pioneer using swipe gestures early on, it hasn’t added haptic feedback to any of the gestures so it’s hard to discern if you’ve triggered them. By comparison, Apple’s built in Mail app has had haptics for horizontal swipe gestures for a while. Reeder feels out of place on iPhone since it doesn’t support this. Feedbin’s web interface makes it quick and easy to access recently read articles (sometimes you accidentally tap away from an article and it’s hard to find it again). Reeder doesn’t have any way to access this list. The Mercury Parser button is poorly positioned at the top of the article. This is difficult to reach when using the phone one handed, especially since so much of iOS is now centered around the bottom of the screen. I use that button more frequently than any of the 5 buttons at the bottom of the article yet I can’t customize that toolbar. And yes, I’m away of the ability to pinch to access the parser but that gesture isn’t possible with only one thumb. The parser feature is great and I’m grateful that Readability was quickly replaced by Mercury parser when it was discontinued. However the column text width is a bit narrower than Safari’s reader view. This narrow column looks more awkward on iPhone X. An edge-to-edge column would be better, especially when the background is black. I use the app in black mode at all times. It looks great on iPhone X’s OLED screen. However the built in browser has a big white bar at the top that doesn’t go away when reading an article, even when Safari reader is set to black as well. It seems that Reeder’s color themes don’t carry over to the built in browser. UPDATE: The browser is now dark gray when the rest of the UI is black. Really? That’s not how OLEDs work. Gray pixels are still illuminated. Black pixels are off. Lowering my rating since this change is a big middle finger to my request. I’d gladly pay for access to premium experience features like these. It’s nice that one $5 purchase has given me 6 years of use but I also want the option of more functionality and a better user experience. It needs a way to save easily articles to the reader we use like pocket or instapaper. Everything in Reeder is excellent except one thing. It doesn't support "full screen reading". The bottom bar may look OK in old iPhone, but it's huge and annoying in iPhone X. If we can choose to hide the bottom bar, it would be great. I bought this app years ago and use it daily. It’s the best mobile RSS reader on any platform. However it hasn’t really changed much. Aside from iPhone X support, which is good, the app looks and feels a lot like the same app I first purchased in 2011. While this app was a pioneer using swipe gestures early on, it hasn’t added haptic feedback to any of the gestures so it’s hard to discern if you’ve triggered them. By comparison, Apple’s built in Mail app has had haptics for horizontal swipe gestures for a while. Reeder feels out of place on iPhone since it doesn’t support this. Feedbin’s web interface makes it quick and easy to access recently read articles (sometimes you accidentally tap away from an article and it’s hard to find it again). Reeder doesn’t have any way to access this list. The Mercury Parser button is poorly positioned at the top of the article. This is difficult to reach when using the phone one handed, especially since so much of iOS is now centered around the bottom of the screen. I use that button more frequently than any of the 5 buttons at the bottom of the article yet I can’t customize that toolbar. And yes, I’m away of the ability to pinch to access the parser but that gesture isn’t possible with only one thumb. The parser feature is great and I’m grateful that Readability was quickly replaced by Mercury parser when it was discontinued. However the column text width is a bit narrower than Safari’s reader view. This narrow column looks more awkward on iPhone X. An edge-to-edge column would be better, especially when the background is black. I use the app in black mode at all times. It looks great on iPhone X’s OLED screen. However the built in browser has a big white bar at the top that doesn’t go away when reading an article, even when Safari reader is set to black as well. It seems that Reeder’s color themes don’t carry over to the built in browser. I’d gladly pay for access to premium experience features like these. It’s nice that one $5 purchase has given me 6 years of use but I also want the option of more functionality and a better user experience. This app is the best! I've been using it for years and I love it for viewing FeedBin. I have only one request, please, please offer a dark mode for the iPhone X, it would look amazing!!! Thank you!!! I moved on to Unread. Thank you for updating the interface. The black theme looks amazing. Best news reading app. When viewing all feeds, the small “thumbnails” identifying what website each article is from makes it nice. THANKS FOR THE IPHONE X UPDATE!! 😊🤪 I've been using Reeder several times a day for YEARS. I do most of my web browsing through it. Always a delight - great integration with services like Instapaper. My go to app for reading blogs and RSS content. Simple, elegant and does NOT require me to create an account on their service. Everything can be done locally. Drawbacks are very few, but include bland interface (I would like the option to choose something beyond grey and black), more font choices, graphics and pictures from feeds aren't always sharp and colorful enough (as compared to Flipboard, Apple News and some others---but I don't know if that could be from the source websites and not the fault of the app). Overall, a GREAT investment in my opinion. I suppose that this is a decent newsfeed reader, but it is missing several key features that you would expect in an RSS reader, such as SEARCH capability. You can't search through your feeds for what you're looking for! I’m going to assume better iOS 11 support is coming. Tons of features and a great design. I use this app every day and prefer it's user experience to feedly or Flipboard. I purchased this app because of the integration with Feedly, and I mistakenly believed Reeder would provide the one piece missing from the Feedly app: push notifications. I like the design and interface of Reeder, but for me, it does not provide any additional features that make it worth using instead of the Feedly app. If I used multiple services and wanted to combine them into one app, this would fit the bill, but I only use Feedly, and I was looking for push notifications, which Feedly does not provide. As a result, I wasted $5 to find out this app does not provide the functionality I was searching for.